Fisheries biologists are tagging cobia in a new research project designed to track the migrations of these large game fish. 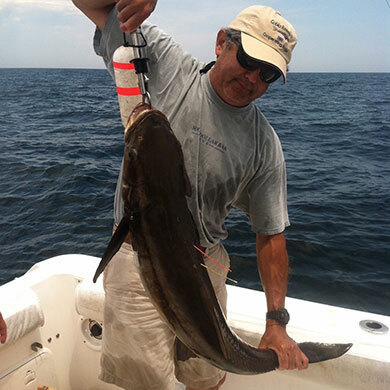 Data collected by scientists and anglers have shown cobia populations along the Southeastern coast to be in decline, and recent regulatory changes at both the state and federal levels have been enacted to rebuild the fishery. To improve researchers’ understanding of this important species, the S.C. Department of Natural Resources (DNR) and the Florida Fish and Wildlife Commission have partnered to implant acoustic transmitters in cobia along the coasts of Florida, Georgia and South Carolina. They’re asking anglers to help by releasing and reporting any double-tagged cobia they encounter. The project will make use of the large array of acoustic receivers along the Gulf and East Coasts, equipment that allows researchers to track the movement of fish and other marine animals. When a fish implanted with an acoustic transmitter passes within range of a receiver, the transmitter “pings,” and the fish’s location is recorded. By analyzing the pings from acoustic receivers all along the Southeastern coast, researchers can piece together an individual fish’s travels. DNR and Florida Fish and Wildlife Commission biologists will be surgically implanting up to 150 cobia with acoustic transmitters, which are about the size of a tube of lip balm. These fish will also be tagged with two traditional, plastic dart tags (one orange and one yellow) that anchor into the muscle next to the dorsal fin. The yellow dart tag bears the message “INTERNAL TRANSMITTER-PLEASE RELEASE,” and both tags are labeled with numbers that identify the fish and contact information for DNR’s game fish tagging hotline. This project will provide important information on the migratory patterns of cobia in the South Atlantic, which will help inform management decisions for the region’s cobia fishery. By working together with DNR to report and release these cobia, anglers can contribute to the conservation of this important species for future generations. What if I Catch a Tagged Cobia? If you catch a cobia with yellow and orange external tags along the dorsal fin, DNR biologists ask that you do not gaff or keep the animal. Instead, use a net or lip-gripping tool to land the fish and record the numbers on each tag. Then, report the tag numbers to DNR’s tagging hotline at (843) 953-9363. Anglers who report tags will receive a T-shirt in thanks for their cooperation. If a double-tagged cobia is accidentally harvested, please report the capture by calling (843) 953-9363 and returning the internal transmitter and both dart tags to the Marine Resources Research Institute (Attn: Matt Perkinson, 217 Fort Johnson Road, Charleston SC, 29412). The transmitter can be found just inside the body cavity on the underside of the fish.